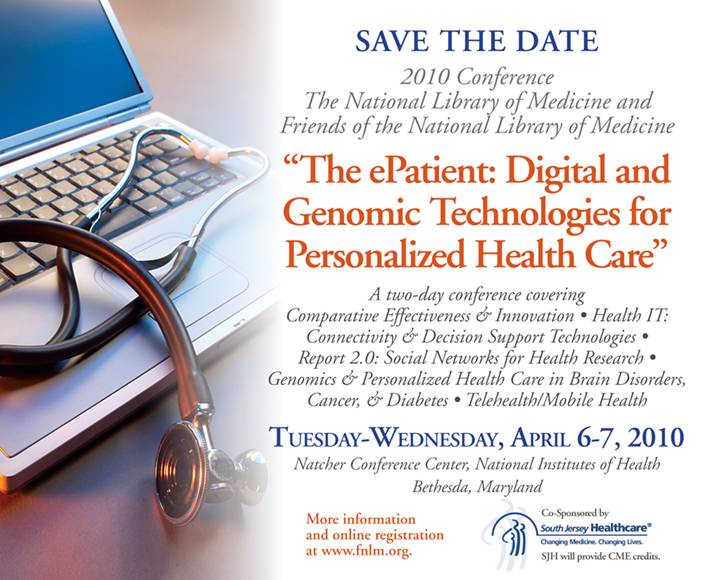 There’s an interesting conference April 6-7 in Bethesda Maryland, sponsored by the National Library of Medicine and the Friends of the NLM: “The ePatient: Digital and Genomic Technologies for Personalized Health Care.” It’s about 70% sold out – almost 350 of the 500 seats are gone. Needless to say, I’m thrilled that the NLM will be hearing about e-patients. Many more (see full list). I’ll be on a panel on day 2. Registration is open to the public for $395; limited scholarships are available. Register online here. For scholarships contact Mirjam Krull.